Senator Ahmed Makarfi, the Chairman of the Peoples Democratic Party, PDP National caretaker committee said that Governor Ayodele Fayose of Ekiti State is on his own in the present campaign mounted by him in his bid of contesting as president of Nigeria in 2019. Markafi claimed that Fayose's move is contrary to the decision of the party’s convention that zoned presidency to the North. He said: “He (Fayose) is on his own. What he is doing is not in compliance with the position of the party. The party’s position has not changed. Makarfi also dismissed speculation that former Vice President Atiku Abubakar may be given an automatic ticket to contest the same position on the platform of the PDP if he finally decides to join the party before the 2019 general election. 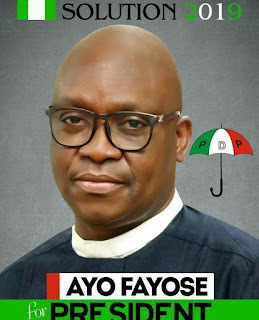 Meanwhile, Governor Ayo Fayose had earlier said that his decision to seek the PDP ticket to contest the 2019 presidential election against the Party’s zoning formula is without prejudice to our party’s position.